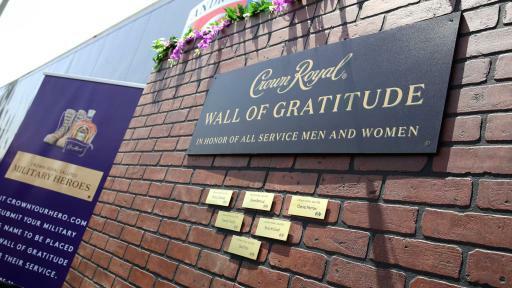 LONG BEACH, Cali., April 13, 2018 -- For the second year in a row, and as part of the brand’s “Live Generously and Life Will Treat You Royally” campaign, Crown Royal is enabling race fans of legal drinking age to submit names of their military heroes for display on the Crown Royal Wall of Gratitude. 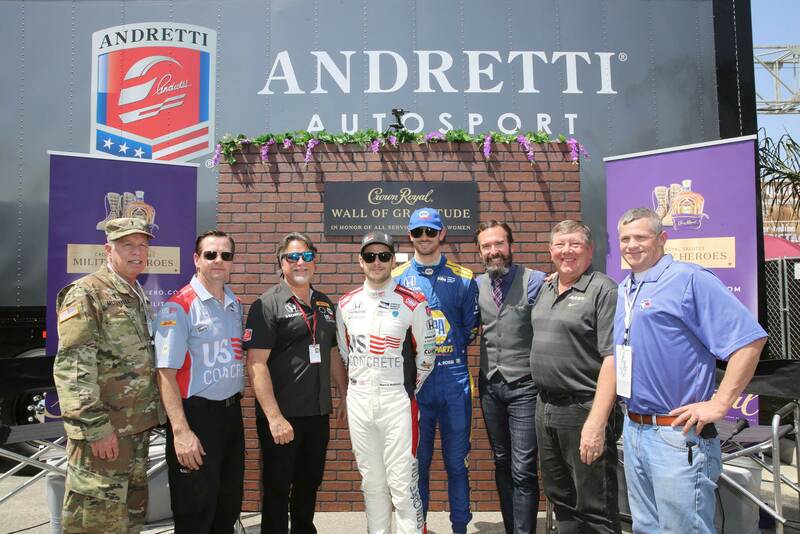 Today, Crown Royal and the Andretti Autosport team held a press conference to announce the driving force behind the program, which aims to honor military men and women at one of racing’s most legendary venues. 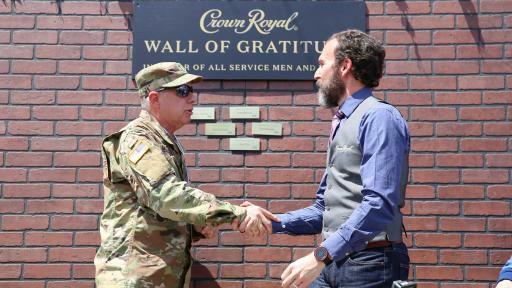 Names of military honorees will be collected by Crown Royal now through Memorial Day weekend, with a goal of 31,680 names. 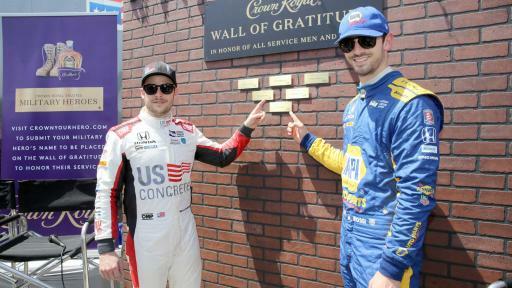 Each name will be engraved on a five-inch gold plaque and, when placed side-by-side on the Wall of Gratitude, the plaques will equal the length of one complete lap around the Indianapolis Motor Speedway. 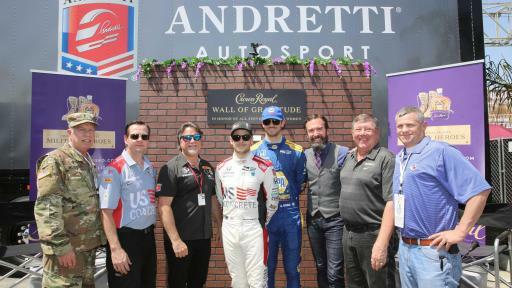 To officially green flag the initiative, Rossi, along with fellow Verizon IndyCar Series driver Marco Andretti, Andretti Autosport CEO and Chairman Michael Andretti and Crown Royal Director of Whisky Engagement Stephen Wilson each submitted their own military hero’s name to the Wall. Representatives from Long Beach’s U.S. Vets also joined and were recognized as part of the ceremony. Submissions will be accepted online at www.CrownYourHero.com, and in-person during a variety of at-track executions leading up to the biggest weekend in motorsports, including at the Andretti Autosport Hospitality during Grand Prix of Long Beach weekend and during the Armed Forces and Indy 500 weekends in Indianapolis. 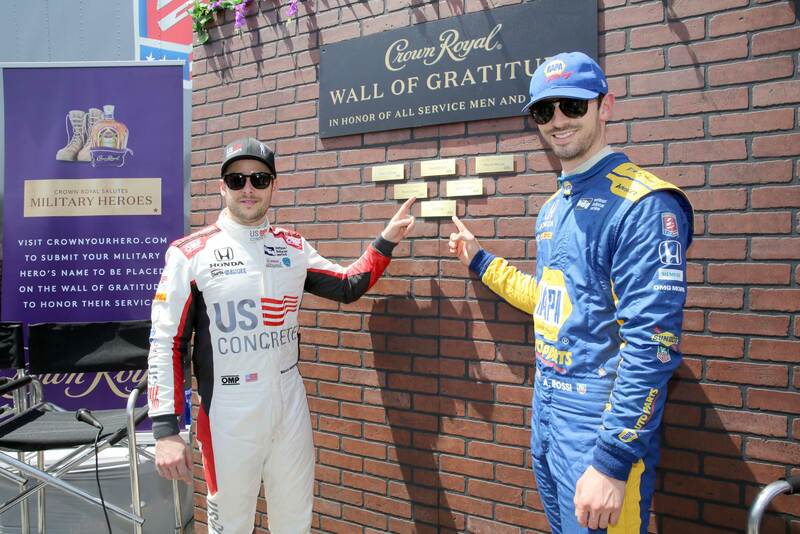 “The month of May is such a thrilling experience for a driver with all the history and prestige leading into to the Indy 500, but this year part of my enthusiasm will be to support race fans in honoring their heroes on behalf of Crown Royal on the Wall of Gratitude,” said Verizon IndyCar Series driver Marco Andretti. 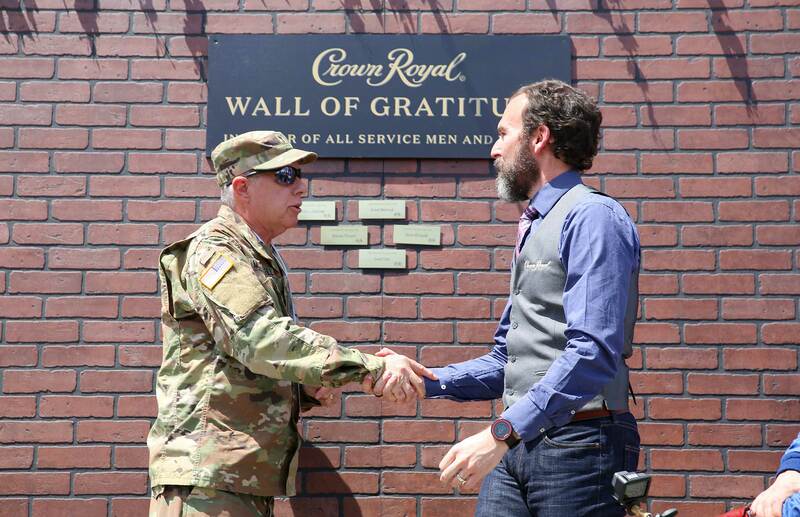 Crown Royal’s history of inspiring exceptional generosity in all its forms goes back more than a decade. The brand has a long-standing history of supporting those who serve our country. 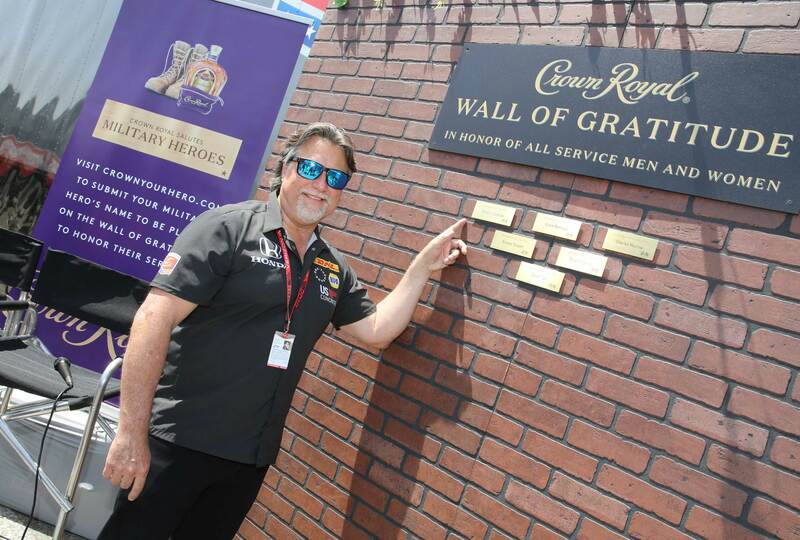 In addition to collecting names for the Wall of Gratitude, Crown Royal will be assembling care packages, during activations at Indianapolis Motor Speedway, for deployed troops through their ongoing partnership with Packages From Home. 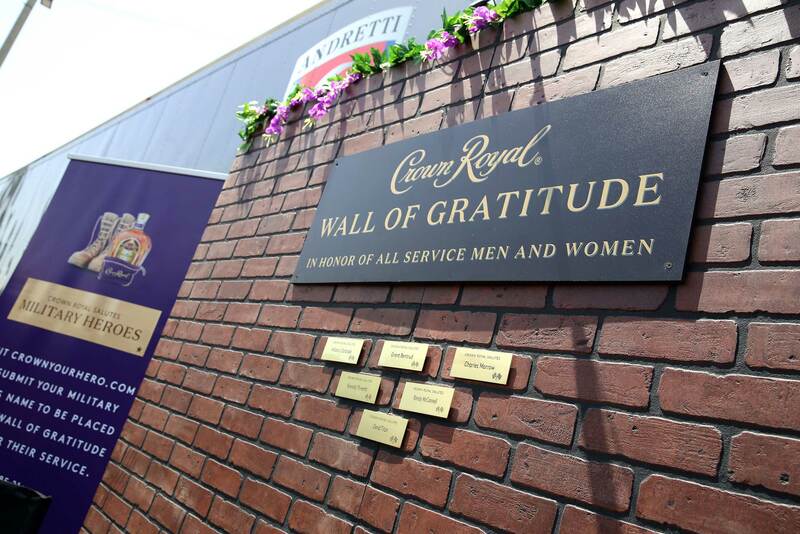 Crown Royal asks that all race fans honor generously, but drink responsibly. Crown Royal Canadian Whisky is the number-one selling Canadian whisky brand in the world and has a tradition as long and distinctive as its taste. Specially blended to commemorate a grand tour of Canada made by King George VI and Queen Elizabeth of Great Britain in 1939, Crown Royal’s smooth, elegant flavor and gift-worthy presentation reflect its regal origins – it is considered the epitome of Canadian whisky. For more information, visit www.crownroyal.com. Crown Royal encourages all consumers to please enjoy responsibly. 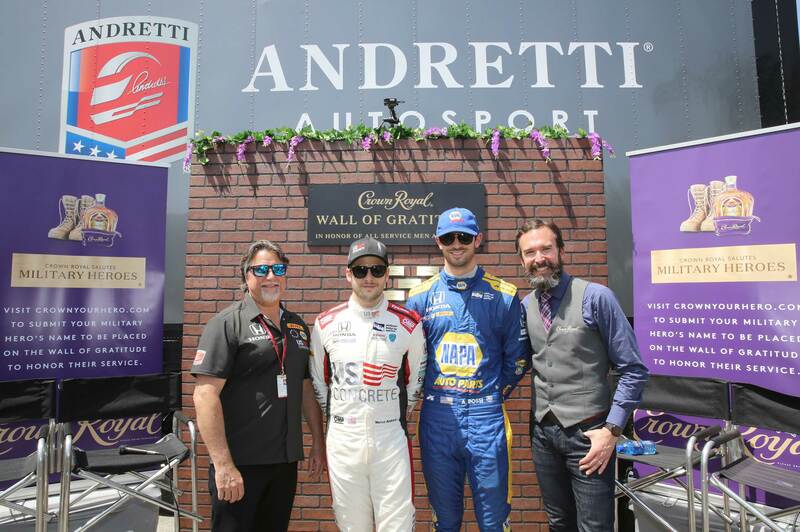 Together with Andretti Formula E and Volkswagen Andretti Rallycross, Andretti Autosport fields multiple entries in the IndyCar Series and Indy Lights, along with entries in the FIA Formula E Championship and Rallycross competition. 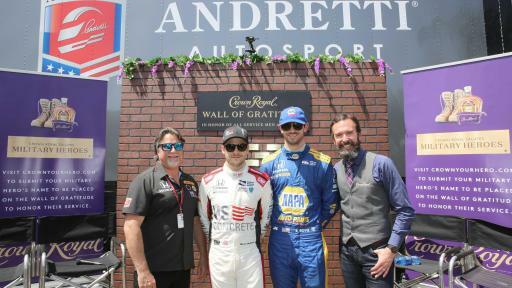 Additionally, the team competes as Walkinghaw Andretti United in the Australian Supercars category through partnership with Walkinshaw Racing and United Autosports. The global racing enterprise boasts four IndyCar Series championships (2004, 2005, 2007, 2012), two Indy Lights titles (2008, 2009), one Pro Mazda championship (2013) and one USF2000 championship (2010) and has captured victory five times at the famed Indianapolis 500-Mile Race (2005, 2007, 2014, 2016, 2017). Additionally, the team holds two X Games Gold Medals and three Global Rallycross championships (2015, 2016, 2017). PLEASE DRINK RESPONSIBLY. CROWN ROYAL Blended Canadian Whisky. 40% Alc/Vol. The Crown Royal Company, Norwalk, CT.